This salvia has been widely available in Australia for a long time. I don’t know if it has been known as ‘Mexican sage’ worldwide but that is its common name in Australia. It must have been thus named before it was generally known how many salvias come from Mexico. It seems the purple and white form is the species but plain purple has been about in Australia at least 30 years. The most recent purple form is very vibrant and I think is much better than the original. (It has also been called ‘Harry’s Red’.) Leucantha ‘Santa Barbara’ is also plain purple and not as vibrant, but the plant is reputed to be more compact. I grow most of my plants in rather squashy conditions so it is hard to be sure of their possibilities. 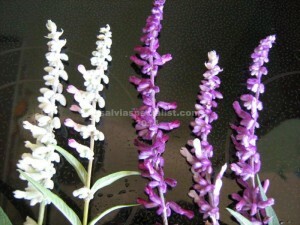 Salvia leucantha has multiple canes about 1m high with greyish foliage. In autumn it is particularly showy and very popular. New shoots start emerging in autumn. When the flowers finish the old shoots can be cut down to the new growth but if you have frosts leave it until spring. Young plants will frost burn but it would take more than -2C to lose an established plant. The pure white and white and pink forms happened in Africa and I was instrumental in their reaching Australia. Originally the pink form was called ‘Danielle’s Dream’ but it has never been known by that in Australia. It was investigated for patenting but wasn’t and the names given to it were ‘White Velour’ and ‘Pink Velour’ by which they should be known in Australia at least. Although ‘Santa Barbara’ is patented I am able to sell that plant and usually have all leucanthas in stock but they can go out in large numbers for hedges. $8 for this leucantha. Very short of leucanthas as at April 2019 but have a few purple. No more than 2 per order please.